PACIFIC UNION will be moving in upstairs at 156 N. Larchmont Blvd., the historic Keystone Building where Larchmont Hardware used to be. 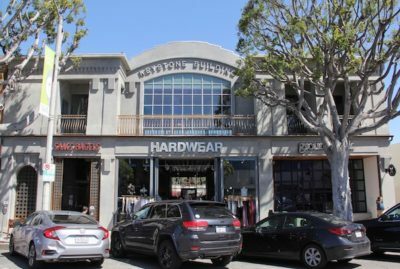 Pacific Union International is set to locate an office this summer on the second floor of the former Larchmont Hardware building at 156 N. Larchmont Blvd. Bret Parsons, a Windsor Village resident who previously was a sales associate at Coldwell Banker, has been named associate manager of the new Pacific Union office — the company’s 21st location in Southern California. Pacific Union originated in San Francisco and recently merged with Los Angeles-based brokerages John Aaroe Group, Partners Trust and Gibson International. Pacific Union will be the third major real estate office in Larchmont Village, following the offices of Coldwell Banker and Keller Williams. The new space will have a “community outpost aspect to it, including the use of its rooftop terrace for non-profits and others to hold events,” according to a Pacific Union spokesman. Parsons will work with a 20-member team, and also will spearhead the launch of an architectural division. The next book in Parsons 12-volume series, “Master Architects of Southern California 1920-1940,” is titled “Roland E. Coate” and will be published this May.